Balkon’s Weapon is a modification for Minecraft that basically provide a lot of variety of weapons to play with in the game. Balkon’s Weapons Mod features melee weapons such as Spear, Knife Warhammer, Throwable Weapons Javelin and Boomerang. Also, it adds shooting weapons such as Javelin and Crossbow along with a practicing dummy for epic fun. This mod is probably the best simple weapon mod for Minecraft and less complicated. Description: A custom mod that brings extra weapons in Minecraft. First you have to keep backup your minecraft.jar folder. It basically need Minecraft Forge API, to try installing it or if you have it then don’t install. Then go towards the downloaded files WeaponMod.zip to the %appdata%/.minecraft/mods/ folder. Start the game once to initialize the weaponmod.properties file in the /mods/weaponmod/ folder. Now there you have it enjoy playing this mod. 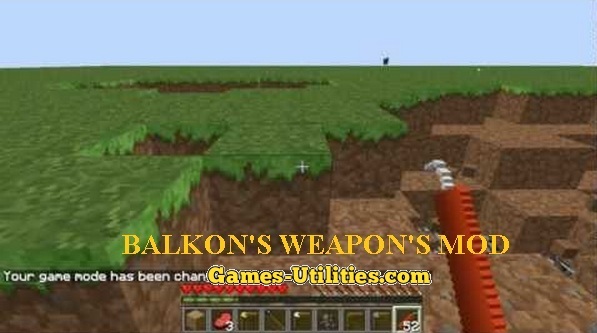 So guys have fun playing Balkon’s Weapon Mod for Minecraft and don’t forget to comeback here and check the latest updates of your favorite game..